I’m joining Today’s Flowers. I took this at the courtyard of Assumption College of Davao, but sad to say after several weeks they all wither and gone. 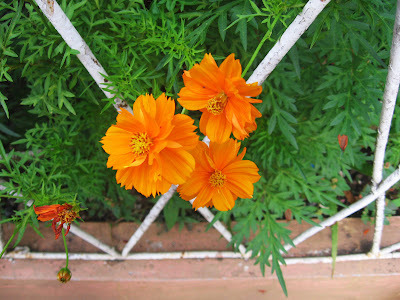 Cosmos, reckoned typically as the love flower, has redefined the very term “love” over and over again amidst its sheen and reek while offering a whole fresh enunciation to the ecstasy of the feeling. What best can illustrate your deep feeling for that special someone than that of the alluring shimmer of the cosmos? What best can epitomize spring than that of the rich- red-radiance, than that of the sapphire romance, yellow splendor, white luster and purple passion of the cosmos? (Borrowed lines from My Dear Valentine). These flowers look abulous. I really have great admiration towards natural beauty. These orange flowers look fabulous. Thanks for the sharing.